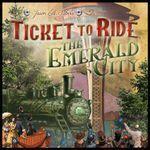 Welcome to Ticket to Ride The Emerald City! Set in Seattle, Washington for the 1962 World’s Fair and unveiling of the Space Needle, this game is both a tribute to Ticket to Ride and the great Pacific Northwest. This fan-made expansion is currently a "Beta Release" for play-testing in the general public, and is designed for advanced players who are already well familiar with Ticket to Ride’s gameplay and mechanics. In this game, you’ll find familiar tracks such as Tunnels and Ferries, as well as the classic Globetrotter Bonus, renamed. But the addition of two new track types, Drawbridges and Tolls, and a new Seattle-worthy bonus card for having the most tracks left over at the end of the game, makes this unforgiving and crowded map anything but familiar. Included are instructions for the new rules specific to The Emerald City. All other rules are based on Ticket to Ride Europe.